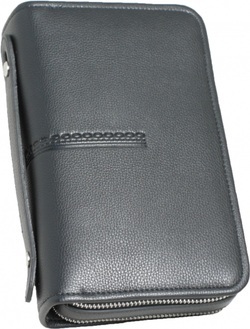 This new Organizer is perfect for the spy on the go. Looking just like a small traveling case no one will suspect it of having a hidden camera attached to a 4GB internal DVR. Capable of recording both audio and color video, the tiny pin hole size camera is hard to find even if your looking for it, never mind when your just passing through. This particular DVR even features a remote to activate the unit discreetly, allowing you to start recording without even approaching the device.